September is the traditional start of school – full of transition from summer to fall activities. 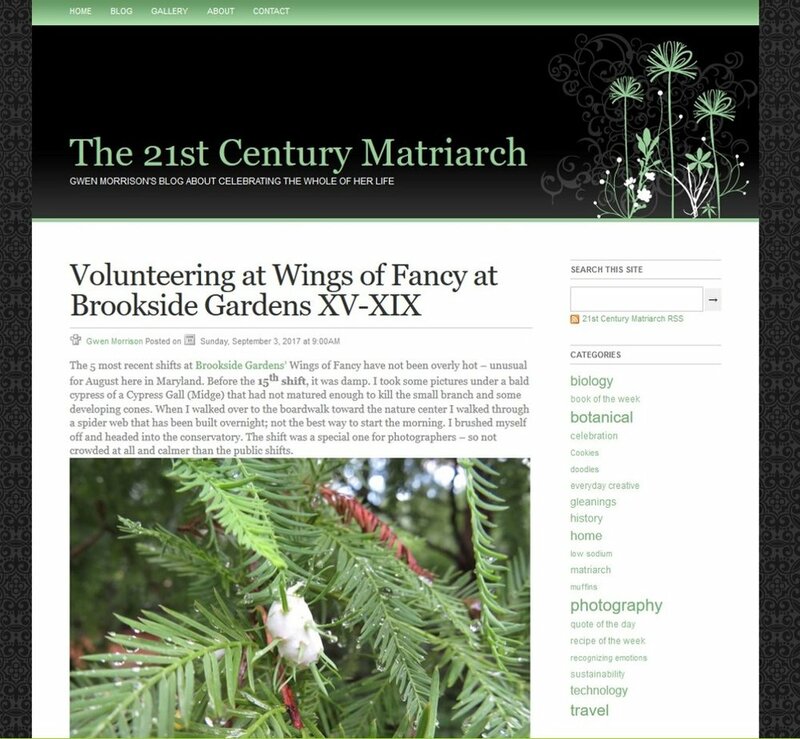 That has certainly been true for me this September in terms of my volunteering: the Brookside Gardens’ Wings of Fancy exhibit ended at mid-month and the Howard Country Conservancy volunteer activities ramped up at the same time. I had to watch my calendar very carefully and set my nav system to get me to the right place! Nine of the ten little celebrations had to do with those volunteer activities. Vicariously sharing the wonder of butterflies with a toddler/preschool playgroup that came into the exhibit on a rainy morning….the children and moms all seemed to enjoy the fluttering of the butterflies around them. The training for upcoming field trips with country schools happened this month….and the weather was near perfect of getting out on the trails to refamiliarize ourselves with the hikes or field work we would be doing with students. The pot luck lunch for volunteers is always a celebration of food and joy among volunteers…before the field trips get underway. The hike from Belmont to Patapsco Valley State Park was enjoyable…worth celebrating. I also celebrated that my hiking group did not encounter a copperhead (hope that we heard about afterward that did get bitten is ok). Having a fresh silver maple tree stump to make into an educational stop on the K and 1st grade hike (and maybe more). Learning something new: how to monitor a conservation easement…I’ve been to the class, need to shadow someone doing it before I try it on my own. Finally, I am celebrating the transition from Squarespace 5 to Squarespace 7. I’m not entirely comfortable with the new software but that is probably normal. It will be old hat soon enough.